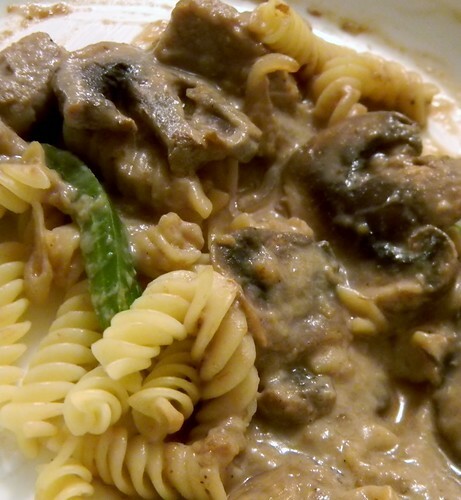 Beef Stroganoff for #SundaySupper's Birthday! | What Smells So Good? Toss the meat with the cornstarch, paprika, salt and pepper. Heat the olive oil in a large, deep skillet over high heat and add the dredged meat. Brown cubes on all sides, then remove to a plate. Meat will not be cooked through. Add the butter to the skillet over medium-high heat. Add the beef back to the skillet, then stir in the red wine to release the browned bits from the bottom of the pan. Mix in consomme and Worcestershire and bring to a brisk simmer. Cover and cook 10 minutes, stirring occasionally. Remove from heat and stir in sour cream. Taste and adjust seasoning.